Understanding how notes, chords, and scales work together to make music is simple when you can actually SEE it in action. The Harmonizer shows the inner workings of music in a graphic way that makes sense. Music theory information is presented around a tube-shaped format that shows notes, scales, chords, modes, and chord progressions in every key. Beginners can use it as a "calculator" to anwser their music theory questions and advanced musicians can use it as a tool for writing music. It works for all instruments and all skill levels. Order now and receive a free ebook. See the Harmonizer in action. Learn how to use each section. Just bought a Harmonizer? This gets you up to speed fast! You practice. You have desire. But, your playing is not where you'd like it to be. You feel like other people know something you don't. What do they know that you don't? It's simple. If you are not thinking of music the right way, you will find yourself stuck, not improving like you should. The fact is, you need to understand the musical patterns before you can bend, shape, and express them. The height of mastery for the musical artist happens when you can create melody and harmony as fast as you can think it. This is true musical freedom and anyone with desire can achieve it. I created a tool to help you experience that kind of freedom in your playing. It's called the Harmonizer. It shows music in a way that will allow you to be the creative musician you want to be. It shows scales, chords, intervals, modes, and chord progressions in a way books can't show. I created the Harmonizer in a unique tube-shaped format initially to help me play jazz. In the beginning, I had no great talent for music. I took lessons and read books. Nothing seemed to work. I even quit a few times. It wasn't until I developed the Harmonizer that music made sense to me. With the Harmonizer I was able to see how chords, scales, and notes all related. It made the complex very simple and easy to understand. Quickly my playing improved and finally I could improvise and jam with others. The Harmonizer is perfect for the musician who wants to improve their playing ability. The Harmonizer shows many of the basics, like which chords make up which keys. But that's only the beginning. Like a calculator that can do both simple addition or trig functions. 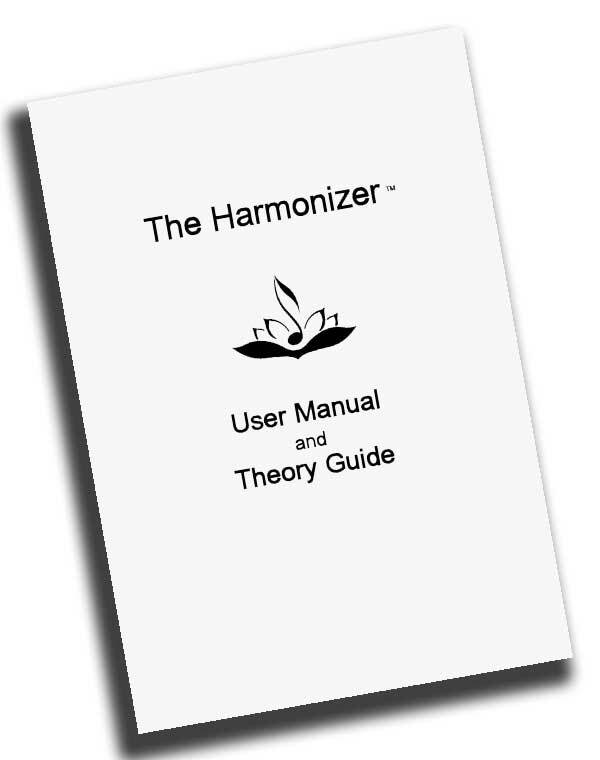 The Harmonizer offers you a wide range of musical information that beginners and advanced musicians can appreciate. The Harmonizer is the most comprehensive reference tool you'll ever own. 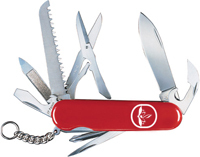 It is like a Swiss Army knife for music. Don't Read Music? No Matter. If you don't read music, don't worry. You don't need to read music to understand it and play it. The Harmonizer works for all skill levels, all instruments. It is especially good for piano and guitar. It comes with the 40-page "Music Theory Guide" that is written in simple language but does not dumb down the subject. No matter how well you play, you need to be able to communicate musical ideas to other musicians. If you don't know the language, you won't know what other musicians are saying to you...and that's not good if you want to play in a band. The Harmonizer explains the most important terms and concepts musicians use today. The Harmonizer's patented design shows you all the information presented by music teachers, schools, and online courses in a quick and simple format. Its versatility helps you to get the most from your music lessons, self-study programs, or college classes. You will get results faster when you add it to your learning program. There are plenty of expensive books, DVDs, and online study courses that tell you about music but the Harmonizer is a TOOL that really SHOWS HOW music works. Dollar for dollar and note for note the Harmonizer is your best bet. 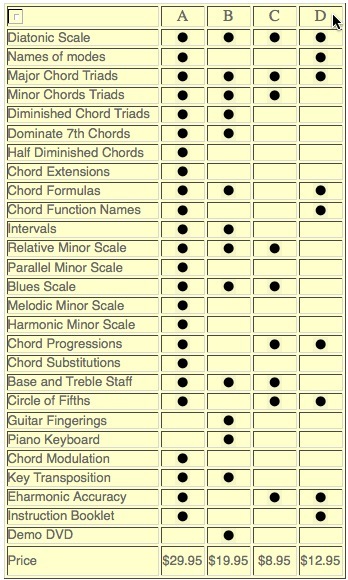 Every note, chord, and scale follows a natural pattern. When you learn that pattern, you can improve your playing without spending a lot of money. The Harmonizer is designed to give you the information you need to be a better imporvisor and composer but it is also valuable for musicians interested in improving their understanding of music theory. This thing called "music theory" is simply the study of the relationships between notes. That's it. Some people try to make it into more than that, but that's all it is. Professional musicians know this (even if they don't admit it) and use it to their creative advantage. Music theory is not a set of rules. It is the living, breathing anatomy of music. Whether you're into jazz, pop, country, metal, or the classics, knowing music theory will give your playing a creative edge. You never know what's possible until you try. I'm confident that you will love what the Harmonizer does for your playing. If you order now, you can try it for 30 days risk free. If you don't hear a difference in your playing, you can return it for a full refund (less shipping). No questions asked. When it comes to other products there is not much that compares to the Harmonizer for features and price. The Harmonizer is chock full of incredible features but what it does for your playing is the most amazing thing. "The way music theory is presented is brilliant." "I've been plaing music with friends for years. Now I can tell them what I'm playing." "It's helped me take my music to the next level." 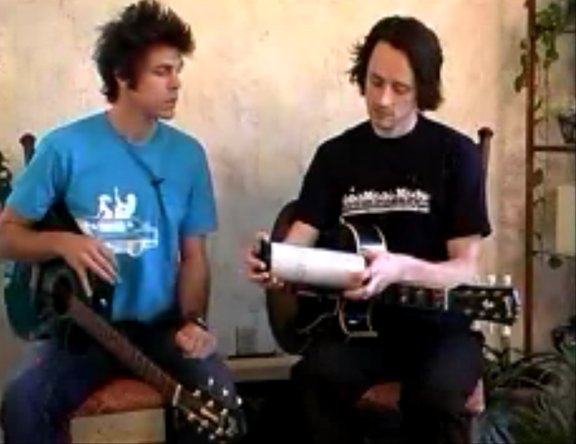 Professional musicians James Mays (left) and Chris Gephardt give their candid opinion of the Harmonizer in these video clips. Learning how music is made will help you develop your ear. You will be able to jam with other musicians spontaneously and pick out riffs quicker and easier. Playing with other musicians effectively requires speaking the musical language. 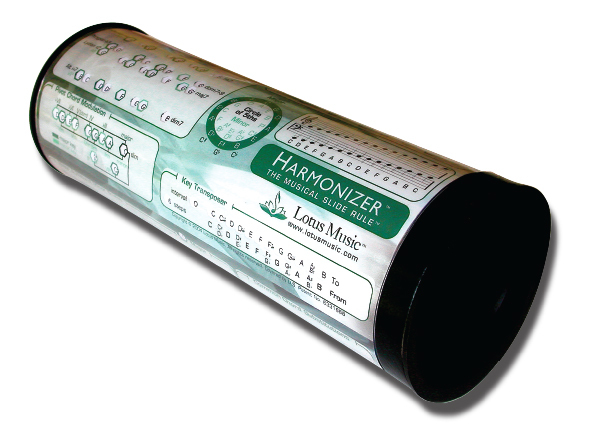 The Harmonizer will give you the vocabulary and musical terms you need to know to best express your musical ideas. Understanding how music is made will expand your creative range and give you new ideas that you can turn into songs. Leaning how music is made is easy. Some people want you to believe it is difficult and it will supress your creativity but just the opposite is true. The Harmonizer is a great tool for transposing songs into different keys. It's fast and it's accurate. Also Included: "User Manual & Theory Guide"
This 40-page user guide spells it all out. The Harmonizer comes with a 40-page guide to show you how to get the most from your new tool. It shows you important music concepts with easy to understand diagrams. It covers, modes, scales, chord construction, substitution, intervals, chord progressions, modulation and more. You don't need music-reading ability to benefit from this book. And, like a calculator that lets you solve simple problems like 2 plus 2 or scorchers like quadratic equations, the Harmonizer is for musicians of all skill levels. Calculate chords, intervals, and more. The Harmonizer is the best music reference device an improviser or composer will ever own. Learn how to use the Harmonizer. 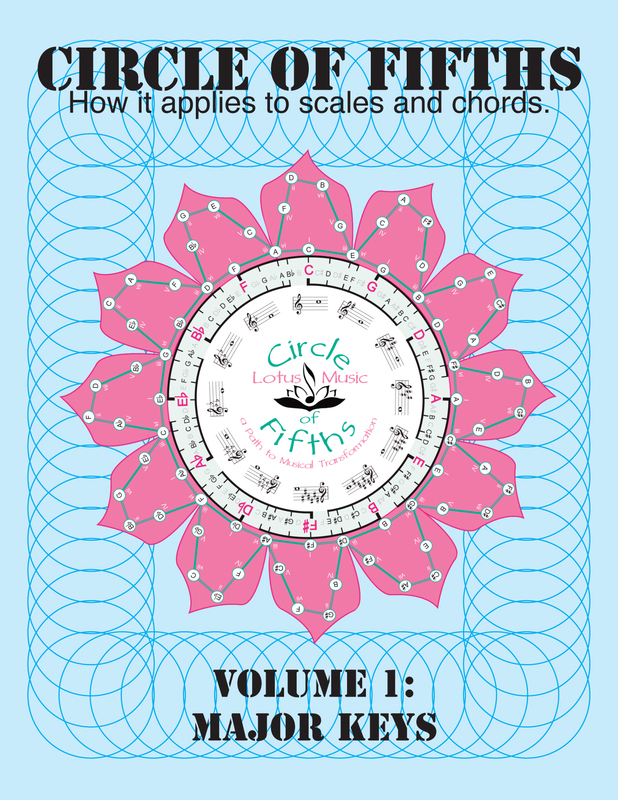 "Circle of Fifths" for FREE. This is a great time to order. When you order the Harmonizer, you will receive a link directing you to your free 57-page book that explains how this famous diagram can actually improve your playing. FREE Downloads  Get FREE stuff when you subscribe to the Lotus Music e-newsletter.